With millions of people suffering from migraine headaches, you're not alone. But if you've ever talked about your migraine pain with another sufferer, it probably didn't take you long to realize that they vary from person to person - as do the symptoms of migraine headaches. Do yours start with an aura? Some sort of "warning" symptom? Do you feel nauseous? Do you get migraine headaches when there's a full moon, after having eaten chocolate, cheese, citrus fruit - or none of the above? 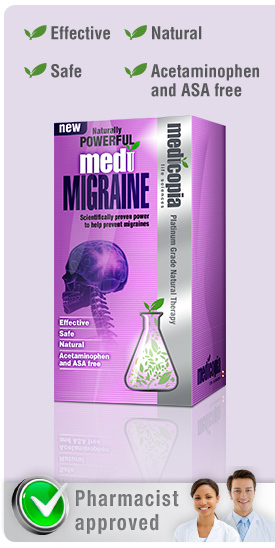 Read on to learn all about migraine headaches, how to identify (and more importantly, avoid) migraine triggers and how to take steps to manage your migraine pain with Medicopia™ MediMigraine™, a natural treatment for migraine. Next >> What are the symptoms of migraine headaches? Previous << What are migraine headaches?